This has to be the worst summer yet on the boat – in terms of weather that is. The good side is that Paul and I have managed to do quite a bit of work and family tree research. In between showers we walked up past Skipton Castle to the woods. Jet has a good look at the beck gushing past the narrow walk way. Well, got here despite the rain showers last night. Paul had a pint of Timothy Taylors and then it was a fish ‘n chip supper. Yum! Moored up outside the old warehouses they are converting into flats, before the swing bridge into the park, and slept well. However, didn’t wake up ’til late as the heavy rain and low cloud made it so dark we thought it was still the middle of the night at 6am. Even the dogs didn’t want to step off the boat, the rain was so heavy! I ask you, where is the summer? I have offered to give a hand with the teas and cakes tomorrow, when my cousin Norman and his wife Margaret open their garden to the public, but I don’t know if I will be needed if the rain continues. 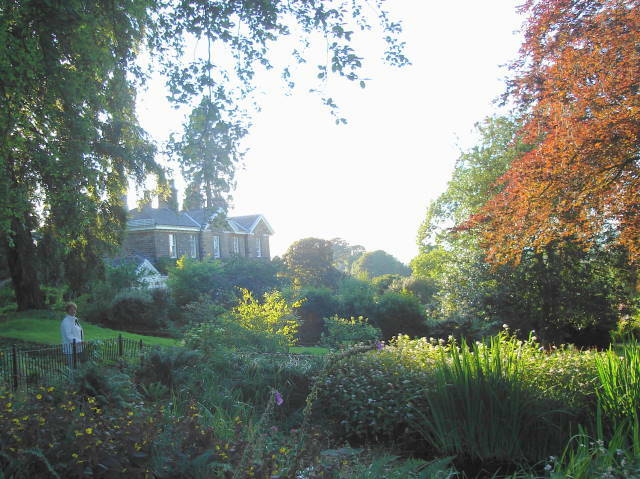 Here is a picture of their garden, taken last year late one sunny afternoon. It is really lovely, so if you are in the area I would recommend you call in. 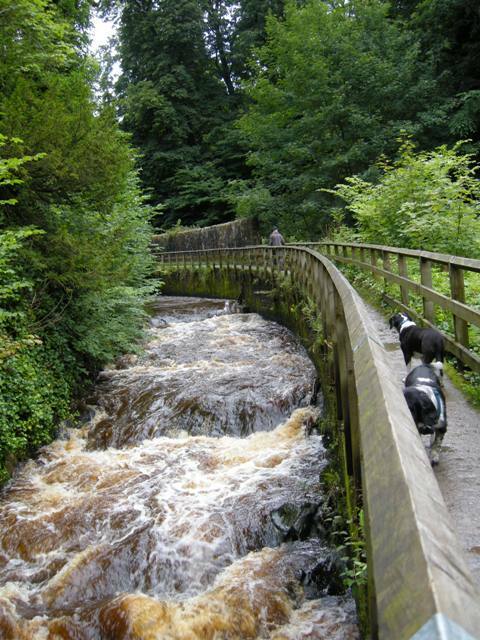 Paul and I are planning to stay around Skipton until early Setember. It is my Aunt Nora’s 80th birthday on 6 Sept and after that we will be making a dash for Leeds and ALT-C for Paul. Just back from a long weekend with family at Ray’s (Paul’s Dad). Really great to be with everyone, but the weather was terrible and our planned visit to Lowther Show, after going to Joan’s grave didn’t happen. For the first time in 34 years the Show was cancelled. Instead we drove out to the Lakes and Ray showed us places that he and Joan used to enjoy visiting. 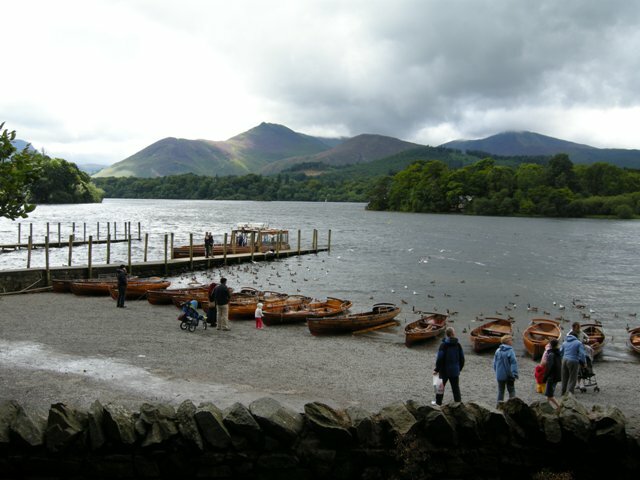 Then we went to Derwent Water and Keswick where he and Joan went on a sponsored walk for the diabetic Society. Paul and I drove back to the boat at Kildwick this morning. All was safe and sound. Paul just doing a phone conference with George and the gang in the Emerge Project, and when he is finished we will move the boat the hour and a half trip up to Skipton. He and I will then get on with some work, in between seeing members of my family. More later when we know what we are doing over the next couple o weeks. He took it on the chin! Now moored up at the top of the Bingley 5 rise, at Crossflatts. There is a railway platform at Crossflatts with a really good and regular service into Leeds. Paul has left this morning for a meeting with George in Oxford. Expecting him back tonight. 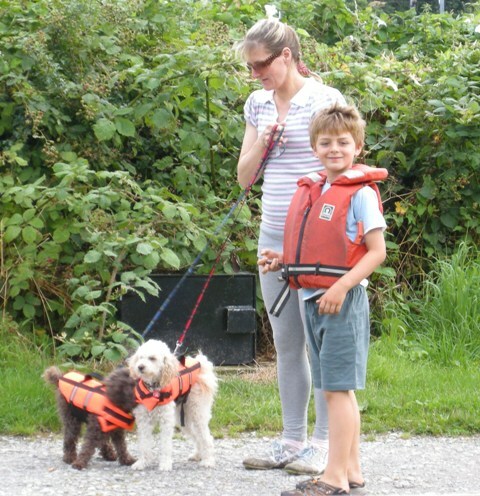 So that is Barry’s view about the life jackets the lock keepers and other British Waterways staff have to wear. He has been looking after the flight for 30 years (another 12 to go before he can retire) and in all that time he has made sure boats go up and down safely. Its not an easy job and needs a lot of concentration. BW and all us boaters would really miss him if he left. 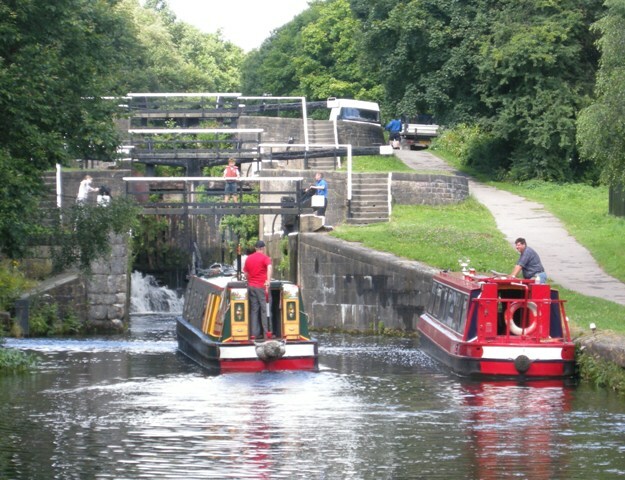 We set off at 7am aiming for Rodley, which is the first place BW tell you is safe to moor after you have left Clarence Dock. We were joined by Mark and Carol and thier 5 children and 2 dogs, who were keen for an early start and to share the locks en route. It was a bit of a push against the current the 1/4 mile or so up river to “River Lock”. Getting into the lock moorings were tricky as the current slammed the boats against the wall. Still we made it OK. We went into the lock to wait until BW came to unlock the top gates. 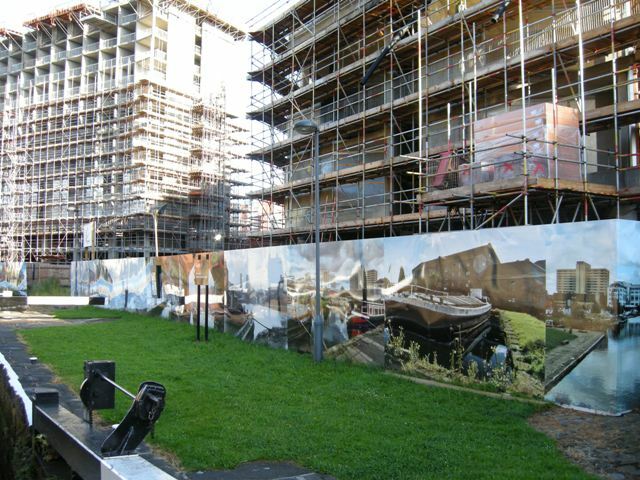 I took phots of the pictures on the boards that seperated the lock from the building site..
And we waited for BW to come and unlock the gates….until Paul realised only one of the top gates was locked! We finally got going and made our way through the outskirts of Leeds, quite scenic in parts and help from BW staff at some of the locks. We made Rodley by about 2pm. 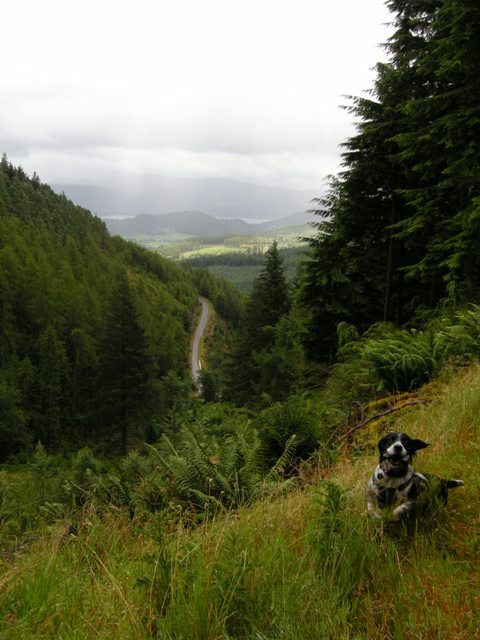 This is where we had stopped last year, when we travelled the route with Geof. 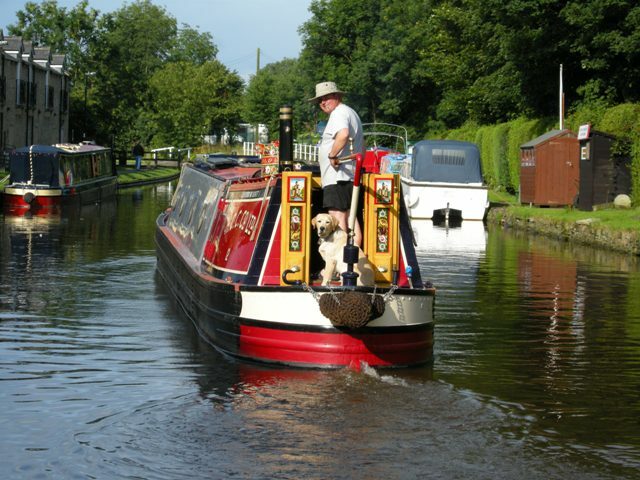 Paul insisted we push onto Bingley, so we rolled in at 7 and moored by the pub. Caught up with Nicky. You are currently browsing the Daniel Oakley blog archives for August, 2008.